I haven’t been blogging much lately. A good part of that reason is because I’ve been spending much of my free time in the mountains hiking 14ers, which brings me to the topic of high altitude nutrition. If you’ve hiked a 14er, you know that they are no walk in the park. Steep slopes, altitude, temperature extremes, and rough terrain combine to make these mountains day long (worthwhile) adventures. Being in the great outdoors all day means planning ahead for proper nutrition. Although it’s easy to forget to eat when you are pushing for the summit, it’s of utmost importance if you hope to get back to your car feeling alright. Caloric requirements are increased at altitude, even though appetite and thirst are often suppressed, leaving those hiking the Colorado 14ers highly susceptible to dehydration and under-fueling. Although consuming enough calories and carbohydrates is important at altitude, fluids should be your main priority. Whether you are hiking on a hot or cold day, you lose water not just from sweat but also from increased respiration at altitude. Studies have found that hard physical work in a cold, high altitude environment resulted in 2 L of water loss per hour! Don’t rely on thirst as an indicator of when to drink as by the time you start feeling thirsty, you may already be on your way to dehydration. Instead, aim to drink 6-12 ounces of fluids every 15-20 minutes (18-48 ounces per hour). Recommendations for training or competition at altitude are 2-4 L of water per day (about 8-16 cups). 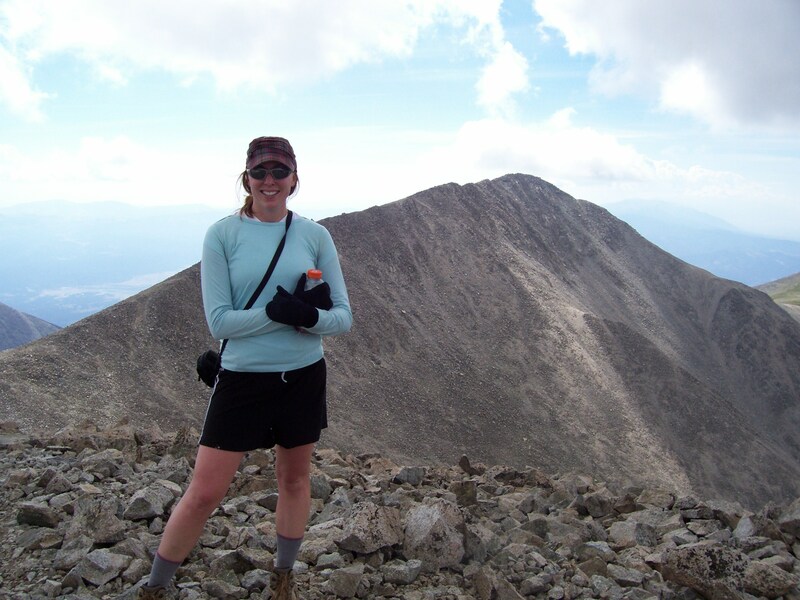 When hiking 14ers, having a Camelback or similar hydration system makes taking small sips frequently easy. Since you will most likely be out longer than a couple of hours (which means you will need fuel), a sports drink such as Gatorade or Powerade can work well in place of or in conjunction with water to help meet fluid and carb needs. The jury is still out on whether or not consuming protein in addition to carbs while exercising is beneficial but I have on occasion put protein powder in Gatorade when hiking and swear I felt even better than when drinking the Gatorade alone (could be the placebo effect). Don’t forget to keep up the drinking once you get back to your car! Carbohydrates are always important during any endurance activity but at altitude your body burns a greater percentage of calories from carbohydrate than it would for the same intensity activity at sea level. The general recommendation for endurance activity is to consume 30-60 grams of carbohydrate every hour (specifically about 0.7 grams per kilogram of body weight) but this does not take into consideration altitude so you may need up to 1.0 grams of carbohydrate per kilogram of body weight per hour. These can be from any carbohydrate source-sports drinks, energy bars, trail mix, fruit, sandwiches, chips, etc . Since your appetite may be diminished, bring plenty of carbohydrate sources that may sound appealing to you in the absence of hunger. I personally always crave Pringles when I hike so I make sure to always have them on hand. Your last consideration, especially if you sweat a lot, is electrolytes and specifically sodium. Most sports drinks and sports gels contain some but having salty foods, such as the Pringles for example, on hand is a good idea as well. Always bring more food and water then you think you will need. You never know when something will come up that will delay your progress and result in more time spent at altitude. This entry was posted in Sports Nutrition. Bookmark the permalink.